Author: L.T. Rubongoya. Series edited by: Bernd Heine, Wilhelm J.G. Möhlig. 20 pp. Roman, 334 pp. The author, an experienced teacher and native speaker of Runyoro-Rutooro, describes all facets of this Ugandan Bantu language in a form suitable for linguists and laymen alike. After Guthrie, the language is classified as Central Bantu (J.10, Nyoro-Ganda, Tooro). 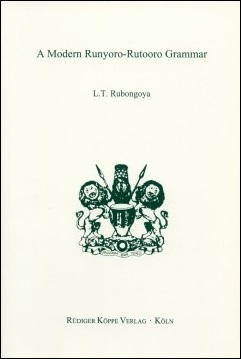 Although the manuscript for this grammar was completed over ten years ago, Rubongoya can be regarded as a protagonist of a very modern trend among African intellectuals who have entered the international scene with writings on their history and culture only recently. These academic contributions challenge the traditional Western universalist approach and provide Africans and Westerners alike with insights available only to a writer from within. In his grammar, the author enters into a dialogue with earlier European attempts at describing the Runyoro-Rutooro language, incorporating what is useful from this earlier literature, but discussing grammatical issues from a new perspective. He rejects, for example, the traditional use by Bantuists of the terms preposition and conjunction to describe aspects of the Runyoro-Rutooro language and opts instead for the term joining words to emphasize that the respective words and phrases have a different grammatical function from prepositions and conjunctions in European languages. This book can be used as a work of reference for all those interested in the Runyoro-Rutooro language policy, its teaching at school and university levels, or in any further study of the language. Furthermore, the grammar can be of value to the comparatively oriented Bantuist, who can draw on material here which is actually in use, in contrast to the far-fetched language examples foreign experts frequently gather. L.T. Rubongoya is a linguist and language teacher in Uganda. Runyoro-Rutooro – really one language divided into two mutually intelligible and closely related dialects – is his mother tongue. This grammar represents part of the author’s efforts to contribute to the revitalization and promotion of the language, particularly in schools. [...] In general, the book is well written and very readable.